Well, trying to hide the actual fact that we literally felt in love with the new Vacheron Constantin Overseas collection, introduced during the SIHH 2016, will be rather difficult. We already showed you the classical edition, the Vacheron Constantin Overseas Automatic 4500V – the sort of entry-level edition – and we continued our journey with the ultra-luxurious but really desirable one, the Vacheron Constantin Overseas Ultra-thin ref. 2000V with Calibre 1120. However, in this collection, there’s more: a masculine and sporty chronograph, which besides these attributes keeps the same features as the rest of the collection: new in-house movement, Geneva Seal, refined look and versatility. 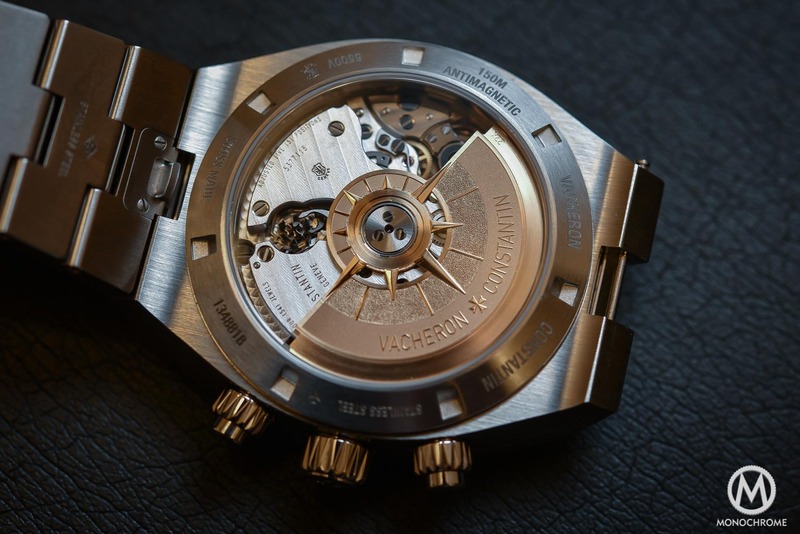 Overview of the Vacheron Constantin Overseas Chronograph 5500V with Calibre 5200. 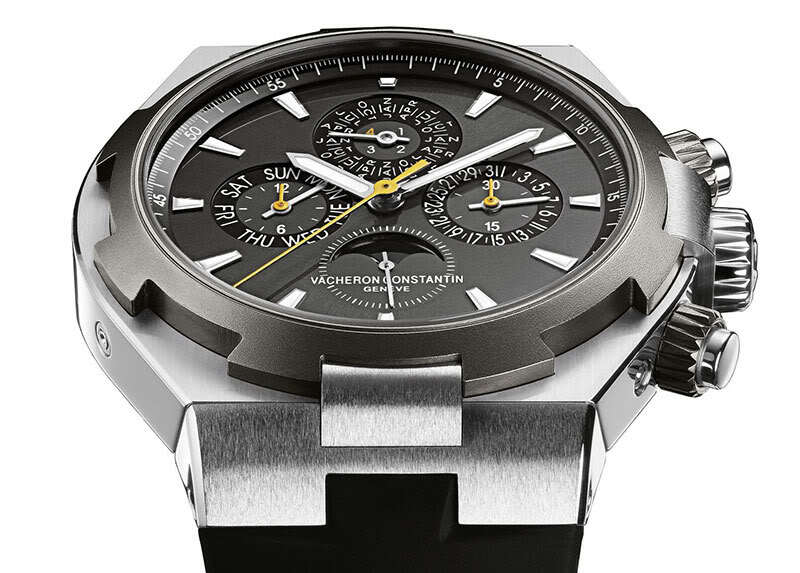 What is the Vacheron Constantin Overseas Chronograph 5500V with Calibre 5200? Well, in all transparency, it is a sports watch. Yes, of course it is. If you look closely, it has everything a sport watch should have: large and bulky dimensions, a chronograph, a stainless steel case, with brushed surfaces, a supposedly good resistance to shocks and daily wear, a sufficient water resistance (150 meters), nice sporty colors… So, yes it is a sports watch. 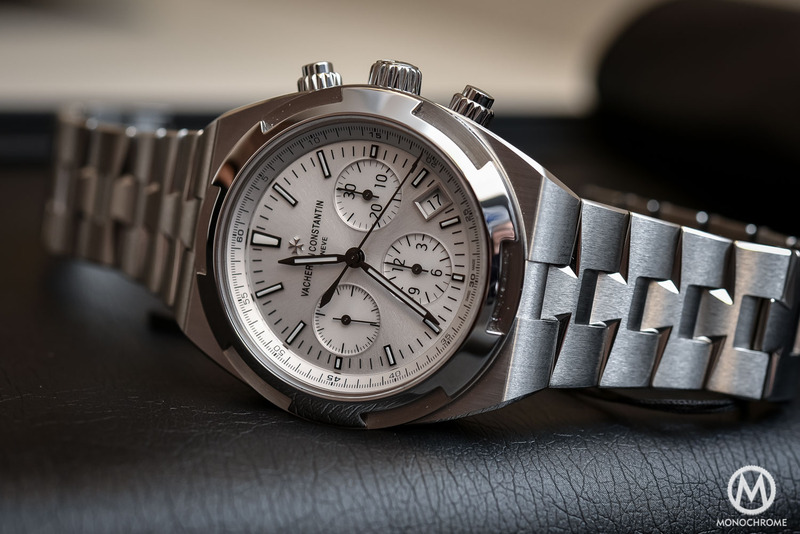 However, on the other hand, the Vacheron Constantin Overseas Chronograph is also a high-end, luxury watch (and what we mean by that is very different than the concept of an Omega or a Rolex). Here, we’re talking about an astonishingly well finished case and bracelet, an in-house movement, developed with care, with an integrated construction, stamped with the Geneva Seal and overall, a rather elegant approach. 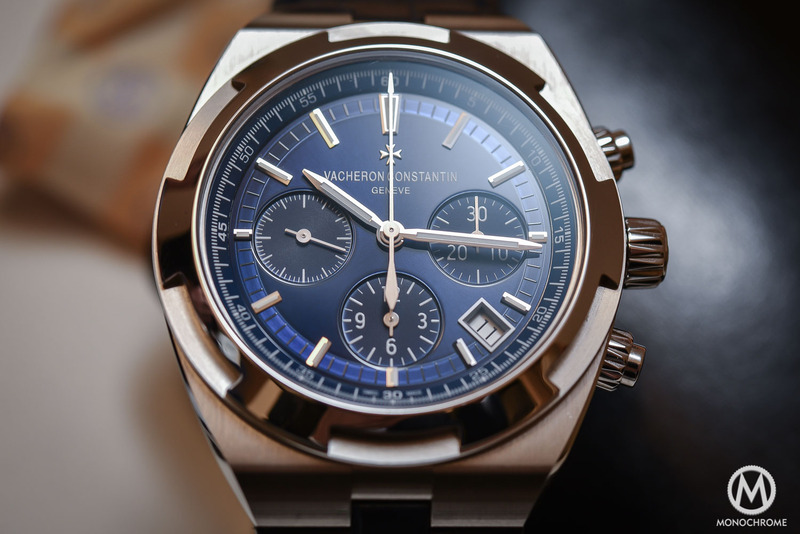 So clearly, we can argue that the new Vacheron Constantin Overseas Chronograph plays in a very limited area: the high-end sports watches, with very few credible competitors. And the good thing is that the new VC Overseas has all the attributes to fight (and win?) against this competition, in the name of Nautilus and Royal Oak. 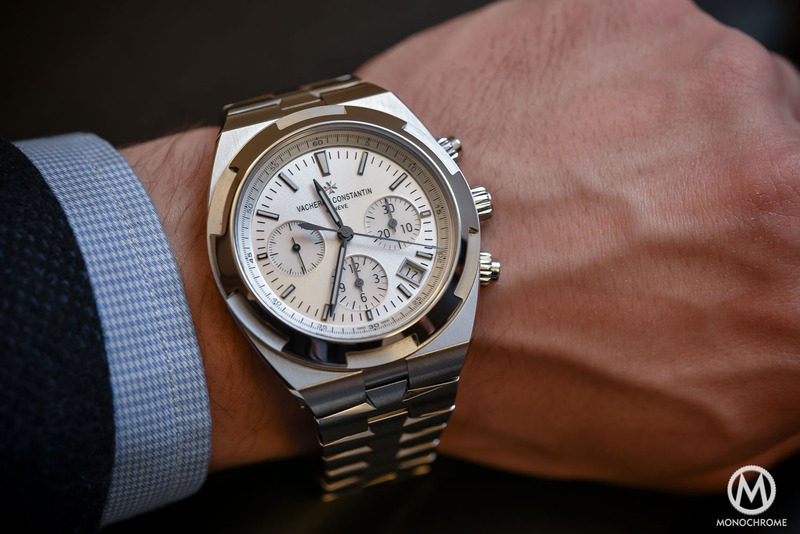 The new Vacheron Constantin Overseas Chronograph 5500V shares the same shape as the other two watches of the collection we showed you here and here. it is not a matter of look nor finish, but rather a question of complications, materials and dimensions. Small and slim for the ref. 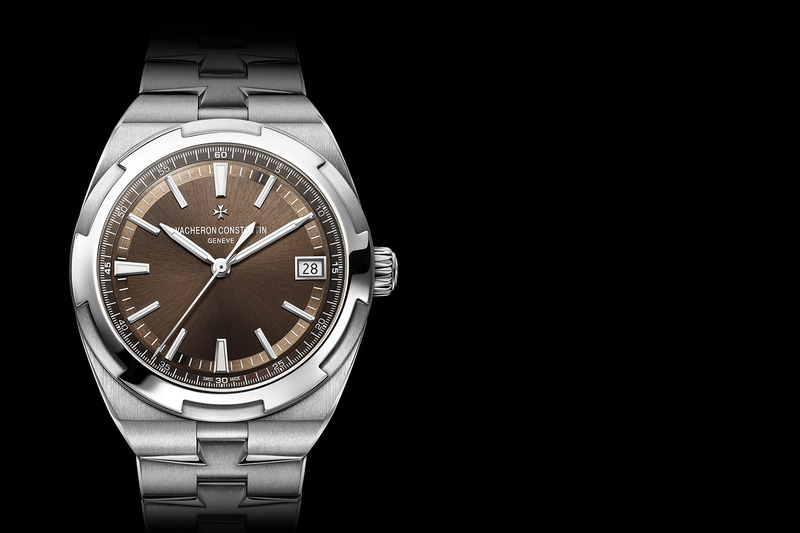 2000V – and luxurious due to the white gold case – intermediate and casual with the stainless steel ref. 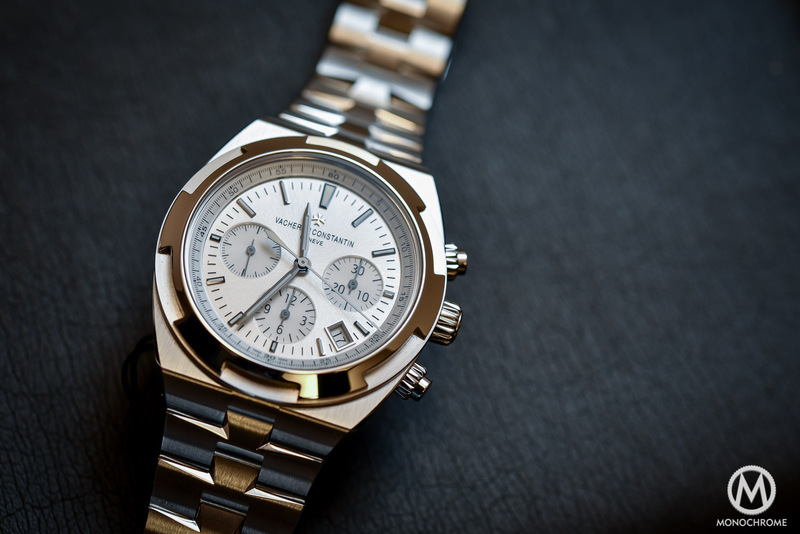 4500V and, you’ve guessed, larger, more masculine and sportier with this chronograph 5500V. 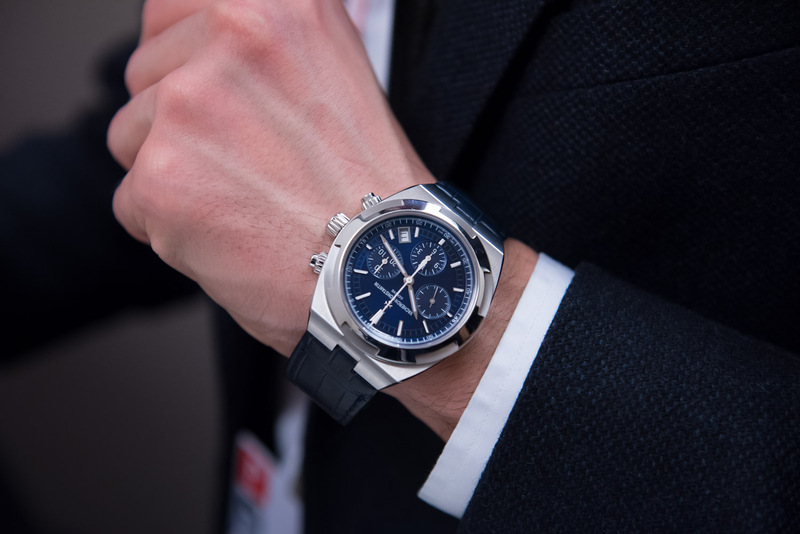 On a more general point of view, the new design brought at the SIHH 2016 is more than welcome, as the previous editions – that you see here in order to compare – were not bad looking but they began to be somehow outdated. It wasn’t blatant – the old Overseas remains a very pleasant watch – but it was probably missing a bit of personality and of modernity. Things have been corrected with the new one. The case of new Vacheron Constantin Overseas Chronograph 5500V is more tonneau-shaped than before, less angular, resulting in a watch that is still sporty and masculine but also more delicate, more refined… In a word, less toolish and more casual. In its chronograph iteration, the Overseas measures 42.5mm in diameter and 13.7mm thick. Indeed, not a small watch. But no worries, it remains easily wearable, considering the integration of the lugs in the case and the strap that goes downward. As we said, the overall shape of the case has evolved, however, the iconic attributes of the Overseas are still here, including the bezel, with six-sided look and the Maltese Cross design in mind. Same goes for the bracelet, which bears this same design code since 2004. 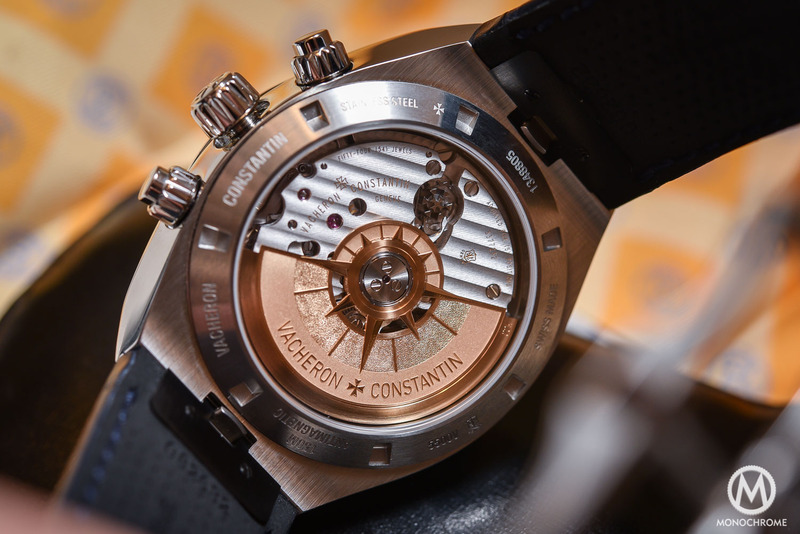 On a finishing level, let’s agree on one thing: Vacheron Constantin has simply done an outstanding job. Wherever you look at, it is superb. The case is finely brushed on top, the bezel is perfectly polished and sharp and the sides of the case show polished chamfers. And what to say about the bracelet. It features the same finish, with flat surfaces finely brushed, chamfers on sides and polished parts around the links. These polished parts, as you can see, are sharp, very sharp – and such angles can only be polished by hand, like internal angles on a movement (but here, we’re talking about a bracelet… Impressive). One specificity of the new Vacheron Constantin Overseas Chronograph is to be delivered with 3 different options for the strap: a stainless steel bracelet, an alligator leather strap and a rubber strap. These interchangeable straps / bracelet will allow to give different personalities to the watch – depending on your lifestyle or on where your about to go with your watch… a business meeting with the alligator strap, a jump in the pool with the rubber strap or simply a weekend at the seaside with the metallic bracelet. it is nothing big in itself, but Vacheron Constantin had the right idea here. 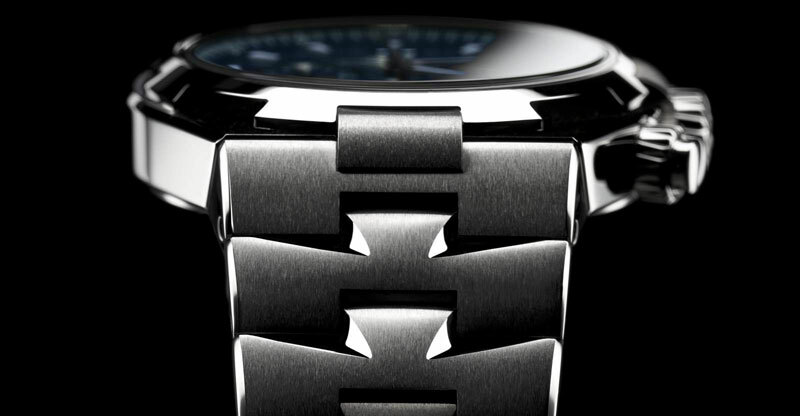 Moreover, changing the bracelet for a strap is extremely simple, by simply pushing a button in-between the lugs. Putting another strap in place is as easy: place it in front, push gently and once you heard a small click, it’s in place – and secured… I’ve played hard during the SIHH with these straps. 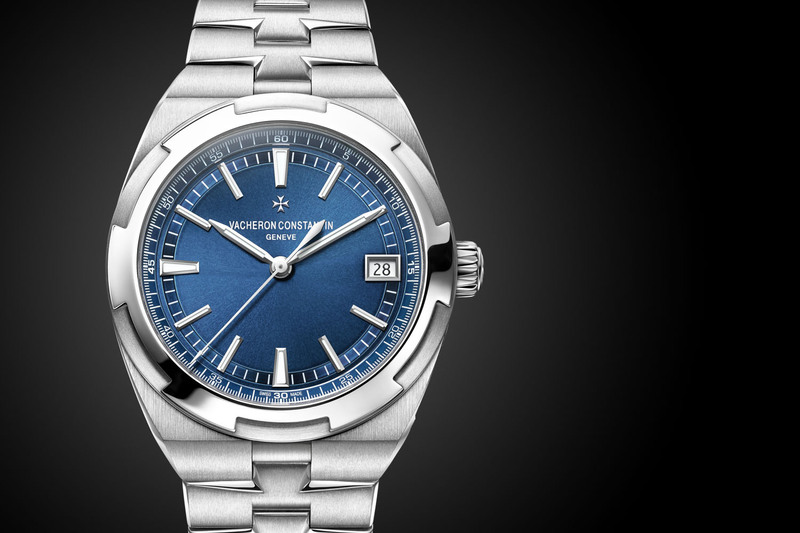 In its stainless edition, the Vacheron Constantin Overseas Chronograph 5500V comes into tastes: a translucent deep blue and a more classical sliver tone. Of course, the blue edition is more striking and photogenic here, but the silver edition also has its interest, with a subtler, more refined look, especially when worn on the black leather strap. Compared to the older Overseas, the dial gets rid of the large date feature at 12, going back to a simpler date, in a window at 4h30. It’s a bit sad because I always thought this date aperture gave balance to the dial. On the other hand, its absence on the new one gives more space and a clearer look. The new indexes and hands are also participating to this cleaner design, due to their smaller and thinner dimensions. Overall, this new dial brings the same feeling as the case: more modern, more refined, cleaner and less toolish. 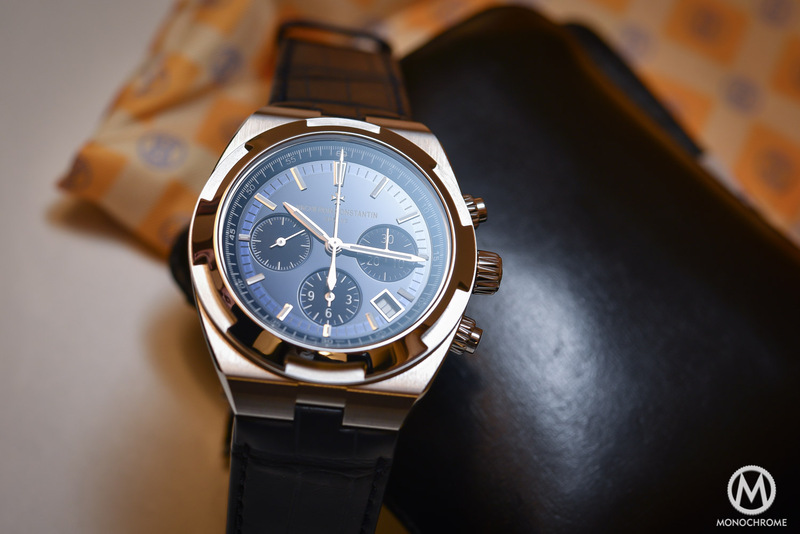 What does the Vacheron Constantin Overseas Chronograph has under the hood? Something quite interesting in fact (to say the least). The Calibre 5200 is indeed a brand new movement, designed from scratch and exclusive to this Overseas collection (for the moment). The 5200 is an integrated movement, supposed to replace the old Piguet-based movement. We’re not talking about a movement developed on the base of the 5100 (the one encased in the Overseas Automatic 4500V) with a chronograph module. Of course, it shares some elements with the 5100, as these two were developed jointly, but all the parts of the chronograph are properly in the movement and not added to the movement – the real definition of an integrated movement. What we have here is a modern chronograph, operated via a column-wheel and as well as a vertical coupling clutch (thus preventing any jerking of the hand when the chronograph starts). Talking about the column-wheel, you’ll see its nice signature shape, with the Maltese Cross (something Vacheron Constantin introduced on the Harmony collection in 2015). This movement is equipped with a twin barrel enhancing its torque and its reliability while ensuring over 50 hours of power reserve. 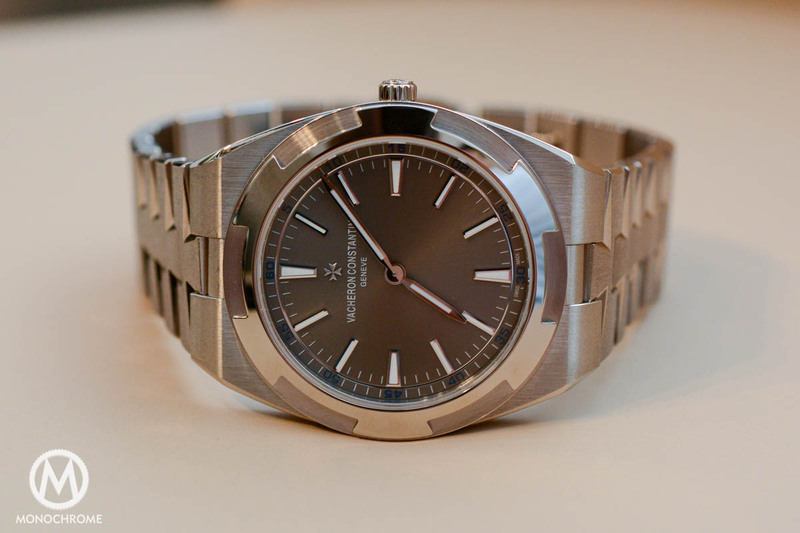 it is protected, like all the previous Overseas, against magnetic fields, via a soft iron ring (and not a cover… something that Vacheron Constantin claims to be a sufficient protection). The Calibre 5200 of the Vacheron Constantin Overseas Chronograph fulfills the requirements of the Geneva Seal, in terms of finishing and precision. It features Geneva stripes, polished beveled angles, straight graining on steel parts or circular graining on the main plate. The execution is on the level expected for such a watch. The look is complemented by a nice 21k gold rotor, depicting the wind rose. One regret though about this Calibre 5200. Its superb finish and its performances apart, it also has the same issue as most of the modern integrated automatic chronograph movements: it doesn’t show much. All the technical elements are hidden behind bridges, expect the column-wheel and the regulating organ. We do understand the comfort offered, on a daily basis, by an automatic winding but we also miss the beauty of levers and gears on a manually wound, old-school style chronograph movement. Modernity, efficiency and reliability were certainly the key words when developing this movement – something that suits the vocation of the Overseas quite well. 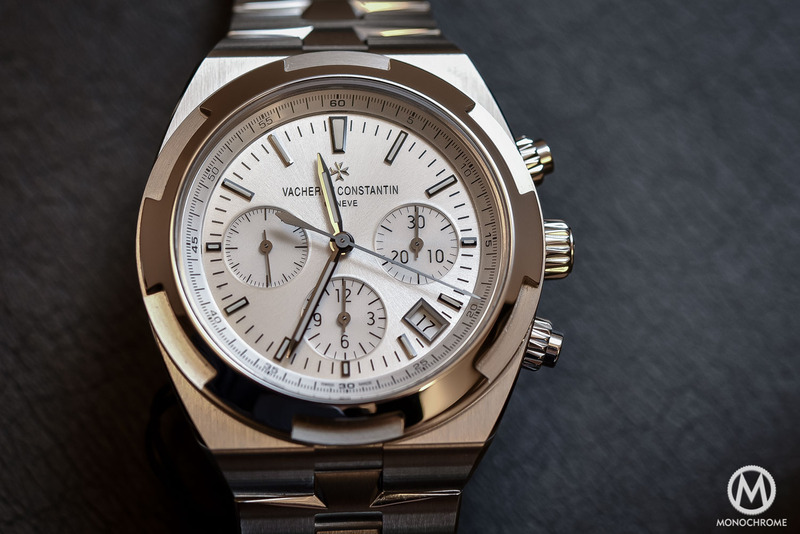 As you’ve understand, our opinion about the Vacheron Constantin Overseas Chronograph 5500V is rather positive. However, everything is not perfect, at least from my point of view. Yes, I don’t like the screwed pushers. I’ve always seen this type of pushers as odd. They tend to overload a watch and, on a user-side, they are not practical. Of course, they are participating to the water resistance of the watch, but some achieve a same result without screwed pushers. Then, as said earlier, we would have loved the movement to show a bit more. But then again, it’s part of the deal with such modern integrated movements. Finally, at 42.5mm, it is not a small watch. But then again, this is considering my personal tastes. Are these comments possible deal breakers? Definitely not. In fact, I’m still more attracted by the automatic edition, more refined and smaller – again, to my tastes. On the other hand, I love chronographs and I believe that such a complication make a lot of sense in the case of the Overseas, giving it a stronger personality, a sportier look and more versatility, without ruining the luxurious, high-end objective of this collection. in fact, I’d love to own the Ultra-Thin White Gold edition for my business meetings, the Stainless Steel Automatic edition for my casual working days and this Chronograph edition for weekends… And now I’m wondering why I wasn’t the one to win the 1.6 billion lottery! Choices are difficult but opting for the Vacheron Constantin Overseas Chronograph 5500V will certainly not be a disappointment, at all. 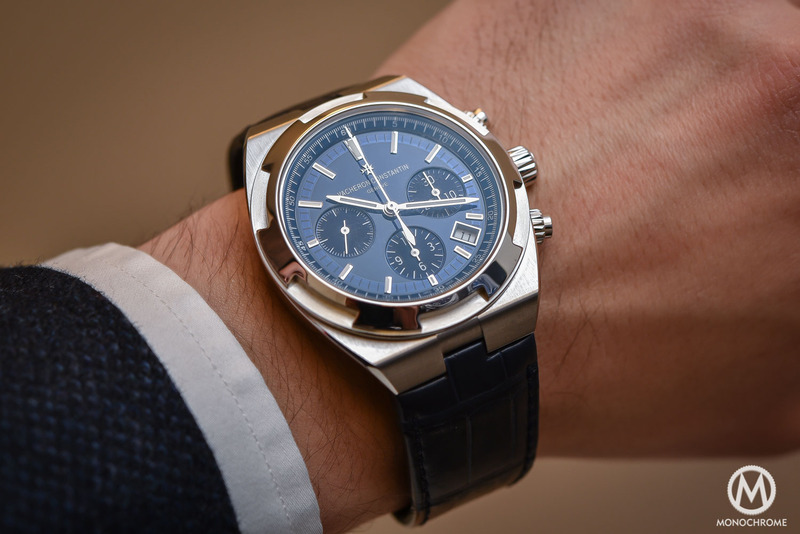 The Vacheron Constantin Overseas Chronograph 5500V, in stainless steel, with the blue or the silver dial, is priced at 31,100 Euros (including a metallic bracelet, an alligator leather strap, a rubber strap and an extra folding buckle). It is also available in 18k pink gold , with a silver dial(on leather strap and with an extra rubber strap), at a price of 52,700 Euros. More to discover on the Overseas collection on the dedicated website here. Got to handle one of these today. Disappointingly bulky.